We are a membership organisation. We presently have about 130 members. At present the subscription is £10 per calendar year. Printed walks programmes are issued twice a year to start in May and November. Our objective is to enjoy the countryside in sociable company. Our walkers come from a wide range of backgrounds and range in age from people in their 40s to those in their 70s and beyond. We welcome walkers of all ages, however all non-adults must be accompanied by a responsible parent or guardian. 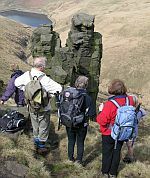 Originally the club was affiliated to the Countrywide Holidays Association (itself formally known as the Co-operative Holidays Association), a national organisation operating walking holidays which was formed in the 1890s. This has now been wound up, but our club decided to continue using the initials CHA. 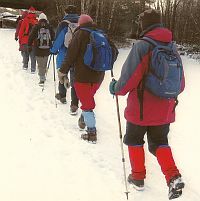 The Plus Section began as a spin-out for the younger members of the club but now the word Plus is used to label the longer and more challenging walks tackled.